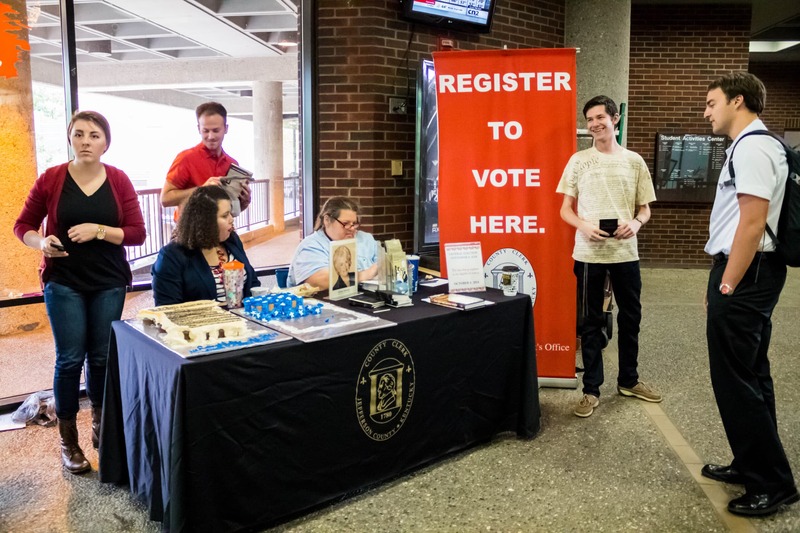 In honor of Constitution Day, which honors the creation of the Constitution on Sept. 17, 1787, a group of McConnell Scholars gathered in the SAC to encourage students to exercise their right to vote and know their rights. Students who attended the event were given cupcakes, a pocket-sized version of The Declaration of Independence and the Constitution and a pamphlet filled with information about voting from the Office of the Jefferson County Clerk. “We are randomly selecting students to take a four question mini-quiz to gauge their general understanding of the constitution,” said sophomore McConnell Scholar Victoria Allen. The quiz consisted of questions about our rights, which are outlined in the Constitution and the Declaration of Independence. Those giving the quizzes found students’ awareness of their Constitutional rights to be very high. One purpose of the event was to encourage students to exercise their right to vote and to be informed of all of their options when the time comes to select new leaders. Students were given the chance to register to vote with a representative from the Office of the Jefferson County Clerk. “We are mainly here today to spread awareness of people’s rights within the constitution and to spread awareness of the history behind the constitution and the Declaration of Independence.” Says Benjamin Gies, a graduate assistant at the McConnell Center.